The United States of America (USA) is a part of North America. The USA is composed of 50 states, which can be divided into the areas of New England, Mid-Atlantic, South, Florida (Main cities are Jacksonville, Orlando, Miami, St. Petersburg and Tampa), Midwest, Texas, Great Plains, Rocky Mountains, Southwest, California, Pacific Northwest, Alaska and Hawaii. The USA's capital is Washington, D.C. and among the largest cities are New York City, Boston, Chicago, Los Angeles, Miami, New Orleans, San Francisco and Seattle. Popular tourist attractions include the Statue of Liberty (New York City), the Golden Gate Bridge (San Francisco), the Washington Monument (Washington, D.C.), the Smithonian Institution (Washington D.C., featuring the National Air and Space Museum, the National Museum of American History, and the National Museum of Natural History), the Guggenheim Museum, the American Museum of Natural History, the Museum of Modern Art (MOMA), the Metropolitan Museum of Art, the Intrepid Sea-Air-Space Museum, and the Ellis Island Immigration Museum (all in New York City). The Travellers Guide has a selection of 3 star, 4 star and 5 star hotels, guest houses and bed & breakfast accommodation in the United States of America, listed below. Please view our hotel offers page for the latest "early booking", "spa break" and "free night" special offers for a range of hotels in the USA. 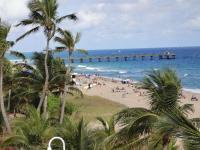 This motel is located across the street from the ocean and is in the center of downtown Pompano Beach. The motel offers free Wi-Fi, an outdoor pool and free parking. Budget Inn Ocean Resort features cable TV with HBO and showtime in each guest room. Rosen Inn at Pointe Orlando, formerly known as the Quality Inn Plaza hotel is located on Orlando's International Drive. The Hotel provides a superb location with access to the area's major attractions such as Universal Studios and SeaWorld. The Orange County Convention Center is within walking distance. 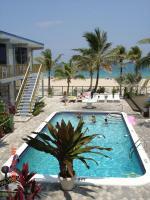 This Key West resort is 2 miles from historic Duval Street and 1 mile from the Key West International Airport. The property features 2 outdoor pools, a hot tub, and apartments with fully-equipped kitchens.